Description: With over 218 verified Muskies over 50 inches, the Double Cowgirl, by Musky Mayhem, has already become an instant classic bucktail. 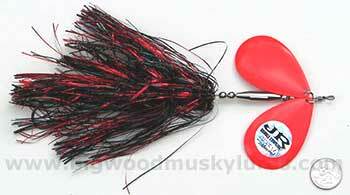 This is the muskie lure that really started the double Colorado blade phenomenon. The Double Cowgirl is a large profile bait with a flashabou skirt and 10# Colorado blades that really move water. Want to catch Muskies? 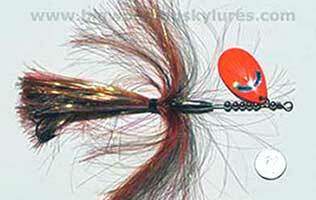 Throw Double Cowgirl bucktails by Musky Mayhem. 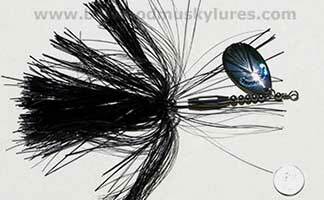 The all new 2010 Musky Mayhem Double Cowgirl colors are posted with a black background. 9 1/2', 2.7 oz. 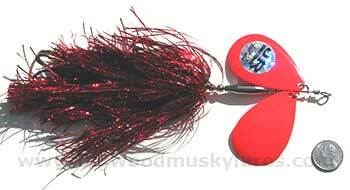 Description: Showgirls, by Musky Mayhem are innovative, light gathering, breathable inline spinner baits. 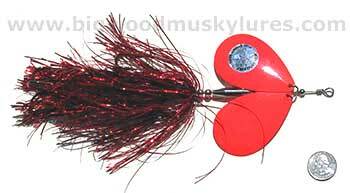 Already a proven fish catcher, this Musky lure has the flash and glamour of a Vegas Showgirl. Burn these Showgirl bucktails over weed beds and pull out giant muskies right out of the thickest slop in the lake. Try one of these bucktails today to experience the mayhem! 8", 1 1/2 oz. 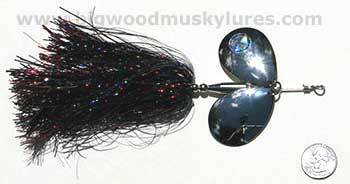 Description: The same concept as the Showgirl, but Musky Mayhem's Double Showgirl adds a second blade to the original Showgirl bucktail. Double Showgirls, by Musky Mayhem, emit a distinctive underwater vibration and have light gathering skirts with two #8 Magnum willow blades. 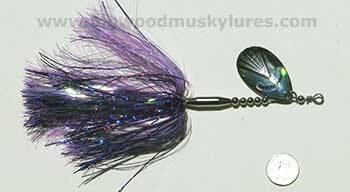 Another great burner bucktail by Musky Mayhem, these muskie lures just simply catch muskies and northern pike. 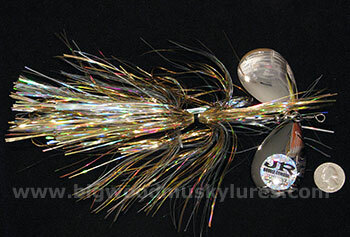 Drive big muskies crazy with this bucktail. Get a Double Showgirl today and let the Mayhem begin! 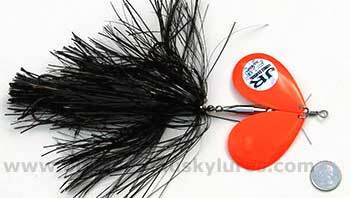 The all new 2010 Musky Mayhem Double Showgirl colors are posted with a black background. 8", 1.6 oz. Description: The JR Double Cowgirl, by Musky Mayhem, is sure to be a big fish lure just like the Double Cowgirl. Only half an inch shorter, this muskie lure sports 10% smaller spinner blades that create a tremendous vibration in the water just like the Double Cowgirl without all the pull. Flashabou skirting gives it color, lifelike action and a huge profile. 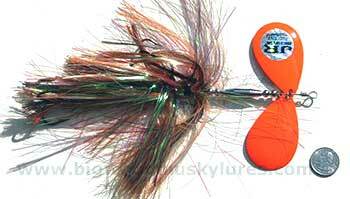 Another "must have" bucktail! Great for both Muskies and Northern Pike. Two 7/0 Mustad hooks - 10", 2 3/4 oz.